The JNH Lifestyles Freedom 1 Person Sauna is made from rich red cedar wood and loaded with luxury features like AUX control and premium speakers. Want a home sauna but don’t have a large space for one? Maybe you’re the only sauna user in the home, or you and your other household members like to enjoy your sauna sessions separately? An infrared personal sauna can add a touch of luxury to nearly any home, even for those who don’t have a lot of space to spare. In this article we’ll go over the basics of what to consider when shopping for a 1 person sauna, and offer some comparisons of the best models currently available. One of the first considerations to keep in mind is that most 1 person sauna models are infrared saunas rather than traditional steam saunas. If you’d prefer a traditional sauna you will likely need to consider a 2-plus person model, as traditional sauna designs require a footprint that is large enough to hold the heater unit. Infrared saunas don’t have this issue, because the infrared heat panels are spread out flatly on the walls. Another important aspect to take into account is space. 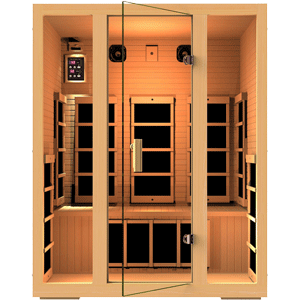 Many infrared personal saunas measure around 3 feet wide by 3 feet deep, give or take a few inches. If that’s still too much space for you to designate to a semi-permanent fixture, you may want to consider a portable personal sauna instead. Also of note is the material that the sauna is constructed of and what that means for you. Basic models are typically made from natural hemlock wood, while cedar wood is available for some units for an additional premium. For example, the JNH Lifestyles 1 person sauna is available in both hemlock and cedar, with the cedar model running around 30% more expensive. Hemlock is a great wood due to its strength, lack of scent, and hypoallergenic qualities. Meanwhile, cedar wood comes in a beautiful rich color and emits a faint cedar smell that some people love. For the environmentally conscious, it may also be important to ensure the wood was responsibly sourced, a feature the models below have. Then, of course, there are the additional features to assess. Built-in timers and temperature setting panels are pretty standard across models, but some have spiced up the feature list with speakers and built-in lighting. 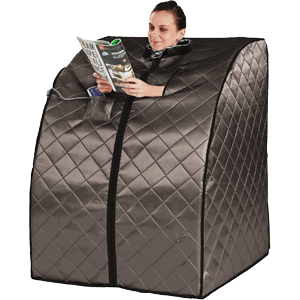 With these aspects in mind, we have put together a list of some of the highest praised personal infrared sauna models below. Continue reading at the end of the list to get a more detailed look at a few standout models. We hope that this information is helpful for you in finding the right infrared personal sauna for your home! Hopefully the comparison chart above is useful in getting a quick sense of the variety of infrared personal sauna models that are available at different price ranges. Below we’ll highlight a few of the highest rated 1 person saunas and go into more detail about what makes them popular choices. The JNH Lifestyles Freedom 1 Person Infrared Sauna has everything you would expect in a luxurious personal sauna. It is constructed from high quality Canadian Western Red Cedar Wood. No chemicals are added to the wood, and it is FSC Certified “Green” Wood. The wood’s tongue and groove construction makes for a stronger structure when set up. This model is designed to get hot and stay hot. It has six carbon fiber far infrared heaters. The heaters are situated at the back of the sauna, the sides, and the calf areas. Dual wall construction is used to provide good insulation and keep the sauna’s temperature consistent. It can reach temperatures up to 140 degrees Fahrenheit. 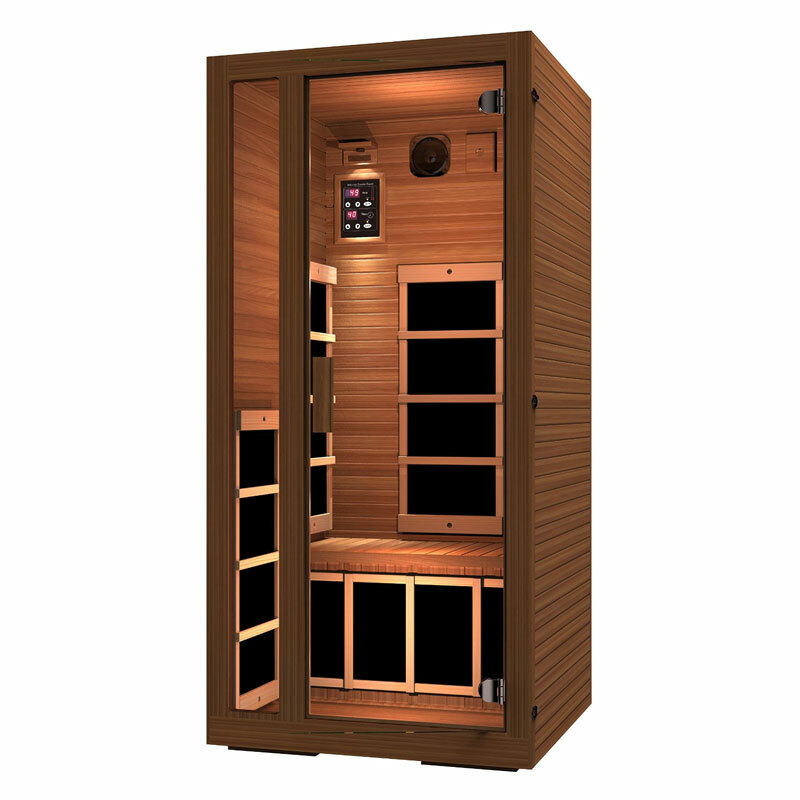 Like many other personal saunas, this one is equipped with a digital control panel that allows you to control the temperature and the duration of your time in the sauna. However this model also has additional perks. It features built-in AUX control and 2 premium speakers as well as LED interior lights. To cover space requirements, this model measures 35.5″ wide by 35.5″ deep by 75″ tall. It has a 120V/15 Amps electrical requirement, which is standard household output. 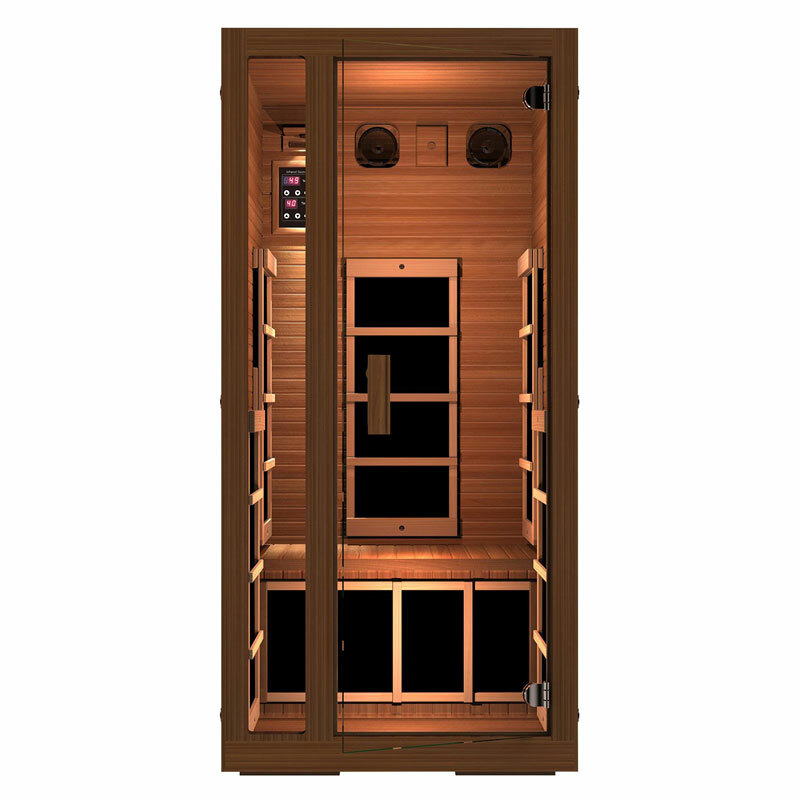 The BetterLife BL6109 1 Person Carbon Infrared Sauna features natural Hemlock wood construction with a tempered glass door. This model makes use of eight carbon infrared heaters and can get up to 150 degrees Fahrenheit. It has both interior and exterior control panels where time and temperature for your sauna experience can be set. An internal reading lamp, MP3 hook-up, and 2 speakers are other notable perks of this model. 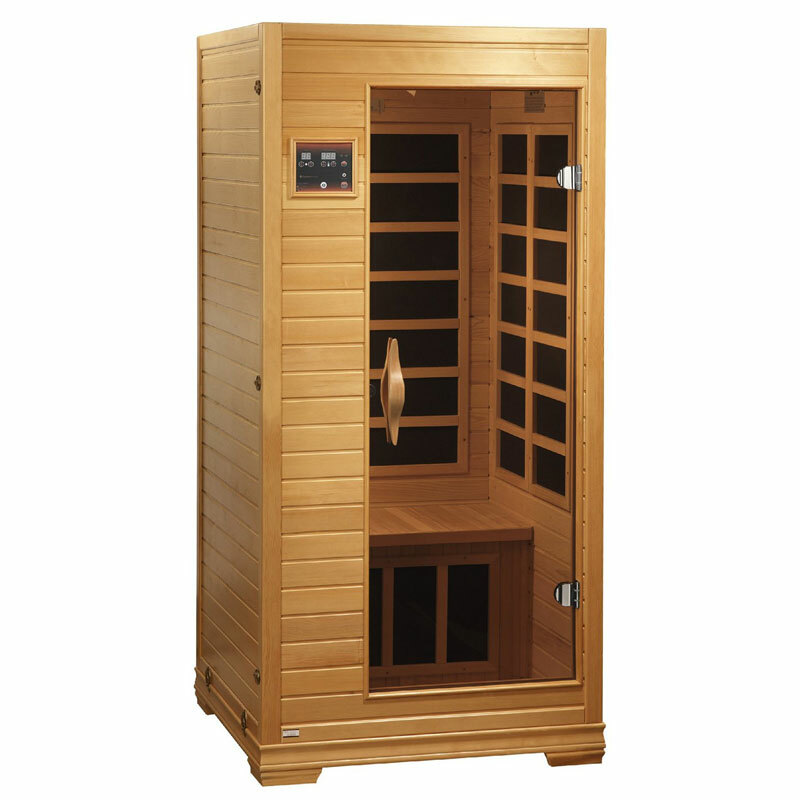 As its name implies, this personal sauna also offers 7 color chromotherapy. It measures 39 inches wide by 36 inches deep by 75 inches high. There is a 7 year limited manufacture warranty on the heating elements and electronics. 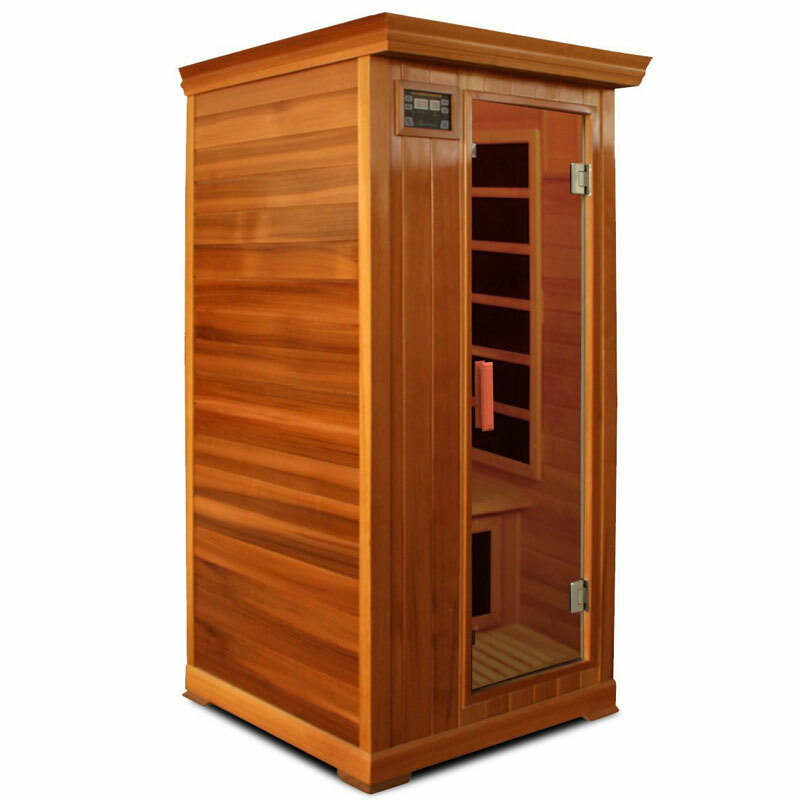 The Crystal Sauna FWC100 1-Person Family Infrared Sauna comes in a stunning Red Cedar. It features six carbon fiber heaters that can produce a heat up to 140 degrees Fahrenheit. This model touts a dual control panel, allowing you to control the timer and temperature for your sauna relaxation time from both the outside and inside. This one person sauna was built with individual comfort in mind. 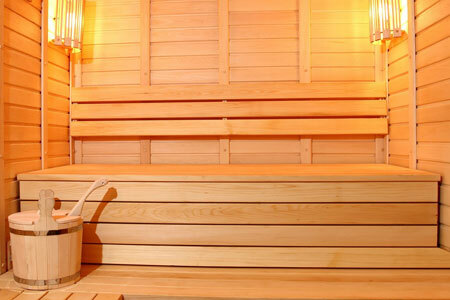 Inside the sauna you will find a 20.5″ inch deep bench, and it comes with portable ergonomic backrests. 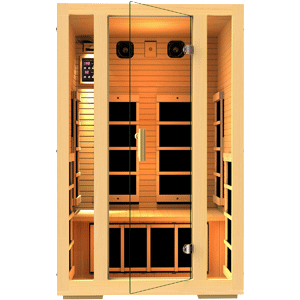 One bonus feature of the Crystal Sauna FWC100 1-Person Family Infrared Sauna is a premium radio/CD player with a USB outlet and an AUX-IN. This model also features color therapy lights. Both the radio and color therapy lights come with remote controls. 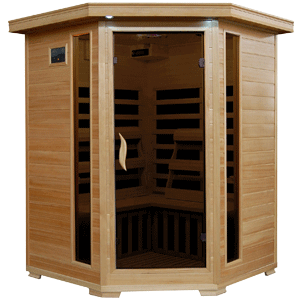 The size of this 1 person sauna is 37 inches wide by 41 inches deep by 75 inches high.